While out walking our dogs with a neighbor on a warm, autumn Sunday morning, we discussed plans for the day. She mentioned she and her husband were going to the theater that evening to hear a New Orleans jazz trombone player and his ensemble. My husband’s ears perked up, as he played trombone in his high school marching band. We waited with anticipation for the concert to begin, reading the program notes to learn more about this young man and his journey from a youth playing trombone on a street corner in New Orleans to celebrity. At 7:30, the house lights dimmed and colored spotlights began flashing across the theater, bouncing off walls and spectators alike. Then came the music. My immediate reaction was “Oh, no! I forgot my earplugs.” The sound was deafening. I looked at my husband sitting next to me, plugging his ears with his fingers. “It’s not so loud this way,” he yelled over the din. Likewise, I pushed my ear canals shut with my fingers. It was still beyond loud. “Okay,” I said to myself, “he loves this style of music and especially the trombone. I can do this.” I wondered if they might tone it down after the first song. That was wishful thinking. We continued to protect our ears as best we could. I looked around the balcony, thinking how goofy we must look, at the same time feeling bewildered. Why didn’t the volume seem to faze anyone else, most of whom appeared to be our age? Fifteen or so minutes passed. The light show was amazing. While I’m sure the band’s musicality would be considered excellent, I found it difficult to focus as I persevered in my attempt to find a comfortable position. I decided to lean forward in my seat, hands over ears, resting my forearms on my thighs. I’m sure it looked like I was bent over in agony, ready to vomit. “Listen, I’d be happy to come back and get you!” I shouted. “No, that’s okay, but let’s stay a few more minutes.” Perhaps he was hoping for a miracle, like a speaker system failure. I continued holding my hands over my ears, thinking of things to distract myself. Birthing my children. Walking barefoot over hot coals. Sticking bamboo shoots under my fingernails. Waterboarding! Well, I’ve never experienced that, but certainly, it couldn’t be much worse than these tortuous sounds bombarding my eardrums. Earplugs are used to block out unwanted noise. We were in a theater, a place people come to hear beautiful sounds. What is wrong with this picture? Curious about all this noise, I decided to investigate the relationship between humans and loud music. Calling it a “stimulant,” Dr. Barry Blesser writes that “raising the loudness of music, like a double shot of whiskey, elevates the intensity of the experience.” Like drugs or alcohol, loud music increases our pleasure response. Apparently, my husband and I are missing that genetic component. I relate more to excruciatingly loud music being used as a method of torture. Highly amplified music was directed at the Vatican Embassy in Panama during the siege of Manuel Noriega. It was also blasted toward the Branch Davidian’s compound in the siege at Waco. The results of our experiences with loud music can come back to haunt us. 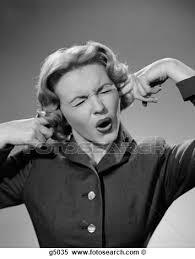 Noise levels over 85dB can cause noise-induced hearing loss. My husband used a phone app to measure the decibel level of the band. It was sustained at over 96dB. Studies have now linked hearing impairment with cognitive dysfunction in older adults. The risk of Alzheimer’s disease has been shown to increase when someone suffers from hearing loss. The evidence is out there. I questioned why so few attending this concert appeared concerned about their hearing, let alone the potential for cognitive dysfunction. Do they consider the future purely hypothetical, a land too distant and remote to be taken seriously or are they simply uninformed? After traveling the dementia journey with both my parents, I pay attention to research and try to make healthy choices, eliminating unnecessary risk. Someday in the future, should my husband convince me to attend another concert and you happen to be there, you’ll easily recognize me. I’ll be the person sporting the neon-pink, noise-cancelling headphones, nodding my head to the musical beat.